weight and as ever, the earth warms to hold them. ← Ta-Da! Join Me at the Barn. For a half a second, I could squint my eyes and think that was Rio standing by the hay barn. Nice New Year’s Eve present. The reason squinting is so sweet. Thank you. Lovely, Anna! Snowing now in Flagstaff. Scooter is delighted! She hears the songs of her people… thanks, Barb. Makes me want to go take a nice roll. Lovely. “the earth warms to hold them” oh my. thank you, as always for your writing, as well as everything else. All the best for 2019. Best to you and your herd, too. Thanks, Chris. (the secret is always in the edit. Thanks Sharon, and to you. I loved that Oregon Clinic! Thank you Anna. “Word photo”! Here in Australia, cool rain yesterday, the house cooled overnight, and this morning I notice our filly has knocked a board from the stable wall, no doubt to let through some breeze, as our days at present soar to nearly 100 F. Love the photo, we never get snow here, it confines itself to our High Country, which as a youngster I knew very well. When the snow lays on the backs of the horses, be sure they are not losing any body heat at all, or it would melt. Love your words. Having downunder friends always makes seasonal writing a bit odd. Thanks Louise. 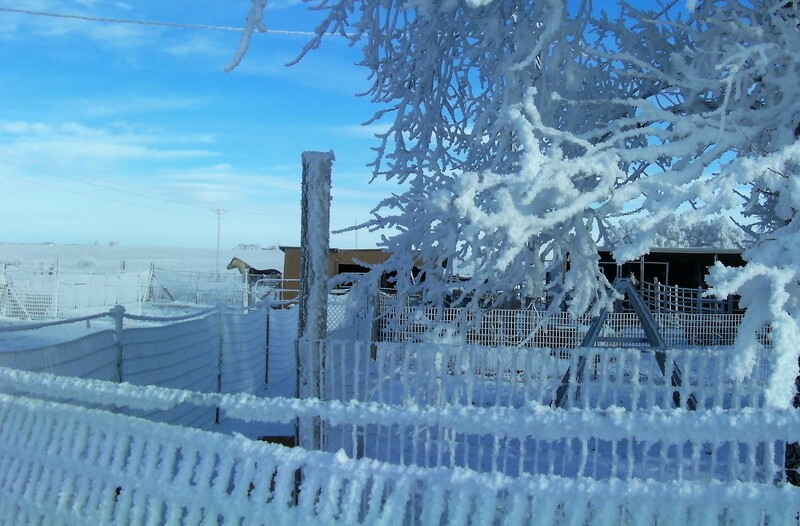 Not so odd Anna, just looking at that photo of fences laced in snow cooled me off! Beautiful poem and photo. Thanks, Anna. Always a highlight of my day. Wishing you and all you love a wonderful new year – and beyond. Thank you, Jean. A happy and slightly cantankerous year to you and yours as well. Oh how beautifully described! I can see my boy going down for a beautiful snow roll, except we haven’t had any snow yet. Then sand will do for now. Thanks Toby.